This morning in my last Genesis class, we studied the story of Jacob wrestling with God. It's in Genesis 32 (we didn't quite make it all the way through Genesis!). 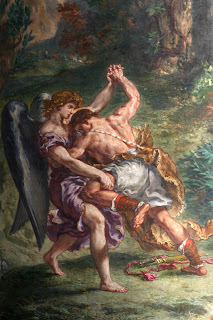 "When the man saw that he could not overpower him, he touched the socket of Jacob's hip so that his hip was wrenched as he wrestled with the man." "The sun rose above him as he passed Peniel, and he was limping because of his hip. Therefore to this day the Israelites do not eat the tendon attached to the socket of the hip, because the socket of Jacob's hip was touched near the tendon." This gets kind of technical, but bear with me, I promise it will get good... My professor, Dr. Provan, started talking about the Hebrew words that are translated "socket" ("kap") and "hip" ("yarek"). He explained that elsewhere in Genesis and in the Old Testament, these are actually words associated with flesh and muscle, not bone (eg. "yarek" is translated "thigh" in Gen. 24:9). It's hard to tell exactly what parts of the body the author is referring to. The custom it describes (not eating parts of the meat) didn't even make it into the Jewish law - this is the only mention of it. The word translated "tendon" is "gid-hannasheh", and this is the only place it's used, so it's impossible to know exactly what it means, but it seems to be some sort of "fleshly appendage". At this point, the less mature students in the class (including me) were already giggling. So Dr. Provan has a theory, unprovable, but very appealing, in my opinion. Instead of talking about hips, sockets and tendons, he thinks that this passage is euphemistically talking about Jacob's genitalia. Basically, he thinks God kicked Jacob in the groin. That's why he limped. God canned him. God sort of cheated. Which makes sense, because if you know Jacob, you know Jacob is a cheater, and it would be poetic justice for Jacob to be kicked in the crotch by God.